Summary Broadcom-based AC3200 "tri-band" class router with Gigabit Ethernet ports and USB 2.0 & 3.0 storage and printer sharing. The appearance of NETGEAR's AC5300 class R8500 Nighthawk X8 may have made AC3200 class routers obsolete in the eyes of router early adopters. But for smarter folks who like someone else to debug new tech toys, AC3200 is far enough out on the new Wi-Fi technology limb. So for those wondering which AC3200 class router to buy, there's now TP-LINK's Archer C3200 AC3200 Wireless Tri-Band Gigabit Router to consider. Like other AC3200 routers, the Archer C3200 uses Broadcom's XStream "tri-band" architecture, described in MU-MIMO vs. XStream: The Coming Battle For Wi-Fi Airtime. The short story is AC3200's key feature is its potential to squeeze higher total throughput out of multiple 5 GHz devices. XStream doesn't bring range improvement to the party and maximum link rates are the same as AC1900 class, i.e. 600 Mbps in 2.4 GHz and 1300 Mbps in 5 GHz. Important note: You need 3x3 AC1900 class devices to achieve the maximum link rates stated above. Most mobile devices are AC580 or N150 (1x1) and support much lower maximum link rates. 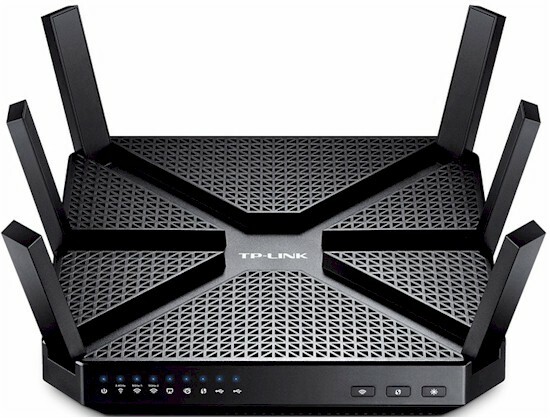 The TP-LINK's design philosophy for the C3200 is similar to NETGEAR's for its R8000 Nighthawk X6. Both have permanently-attached external antennas that fold up from the router top into fixed positions. Three of the antennas are dual-band, handling the 2.4 GHz and 5 GHz "1" radio; three are 5 GHz only, dedicated to the (allegedly) higher-performance 5 GHz-2 radio. All surfaces except for the rear panel have plenty of ventilation holes. There are two mounting screw slots on the bottom that can point the connectors up or down when wall-mounting the router. The callouts for the front panel are shown below. Note these is only a single indicator for all four switched Gigabit Ethernet LAN ports and it doesn't blink to show activity. In fact, none of the indicators blink to show activity. Three handy buttons for Wi-Fi on / off, LED on / off and WPS are right there on the front panel so you don't have to hunt for them. The Archer C3200 has essentially the same Broadcom XStream design as all other AC3200 class routers. The view below is the top of the board after a two heatsinks and inner RF can tops are removed. Like other AC3200 designs, there is a PLX PEX8603 PCIe switch to provide the extra PCIe port needed for the third radio. It sits to the left of the Broadcom BCM4709A SoC near photo center. Note the shield surrounding the USB 3.0 port at photo bottom right. The board bottom view shows the amplifiers and filters. The 2.4 GHz and 5 GHz -1 radios combine to feed the three right-side dual-band antennas (facing front of router), while the left-side 5 GHz-2 radio has its own set of left side antennas. All key components are summarized in Table 1. Note the separate transmit power amps and receive LNAs in the C3200's 5 GHz-2 radio. 128 MB 128 MB 128 MB 128 MB ? The gallery below has more pictures showing various states of disassembly. All photos come from the FCC filing internal photos document. Top of board with heatsinks and RF can tops removed. Bottom view with RF can tops removed. These are all the transmit and receive amplifiers and associated frequency filters (larger white components).